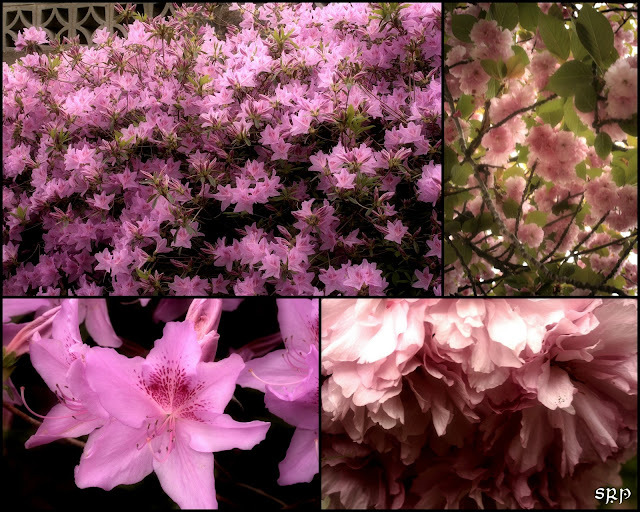 Spring in the south wouldn't be spring without azaleas. In Mississippi, the first of April brings "The Pilgrimage", a two week tour of antebellum homes, replete with period costumes and history lessons. It is the most beautiful time of the year... the pink and white dogwood are in full bloom, daffodils, wisteria, and of course, the azaleas. Many are huge, thriving in the acid soil under the pine trees and lining the long winding driveways that lead to the large tour homes. We have them here in Virginia as well, but they seem to be more at home in the deep South. and butterfly favorites, names unknown. The tulip garden was particularly nice this spring. I was struck by the pink and white variety... one petal was a bright cotton candy pink, the next a pure white. They looked good enough to eat... you could almost taste that pink bubblegum flavor. Two of the plants I have no name for... the star shaped flowers grace the butterfly garden, providing nectar and may be a form of milkweed. 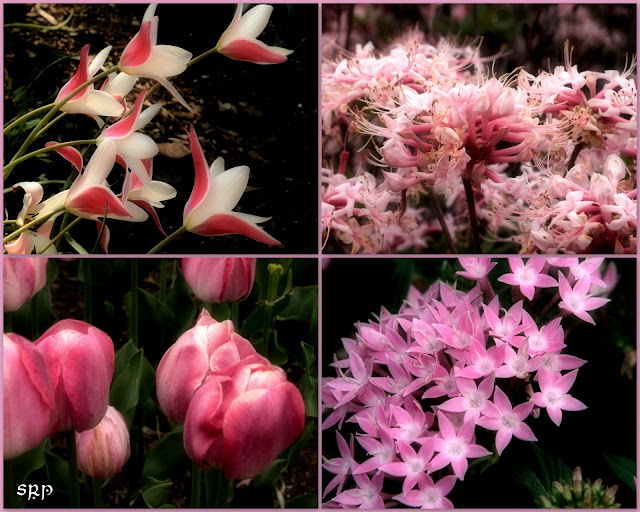 I thought the pinks were beautiful, differences in shade and textures... so many variations on the theme. Petal by petal, leaf by leaf." Sunrise at the oceanfront is an experience... to be there when the first pinks appear on the horizon, before the crowds and the lounge chairs are out.. just you and a lone seagull. The ocean breeze is always cooler than that inland and you sit on the warm sand with the sounds of the waves and you wait.. wait for that bright yellow disc to break through the water and reach for the sky. Even the surface of the ocean develops a pink hue during the process and at that point in time.. earth and sky become as one. 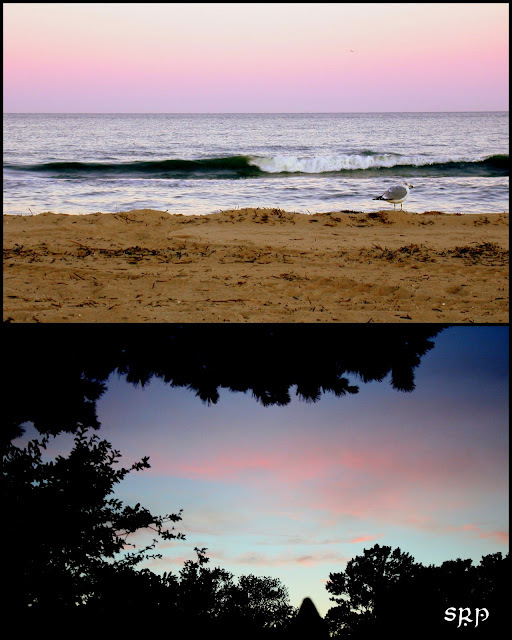 Sunsets are also often tapped with shades of pink reflecting off fluffy clouds... but sunsets show deep, rich, jeweled color palettes while the sunrise deals in the pastels. For fun, I threw in this poor fire hydrant. I think it must be embarrassed to have been painted such a bright "Pepto Bismol" pink hue... and then to be accented with that blazing blue. 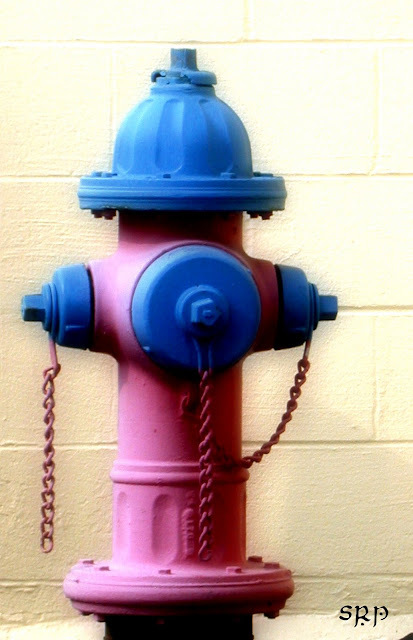 The other hydrants around town are drab metallic gray or bright yellow or even red... but pink and blue? Oh, the shame! Finally, I've added this picture of my mom taken around her sixth birthday. 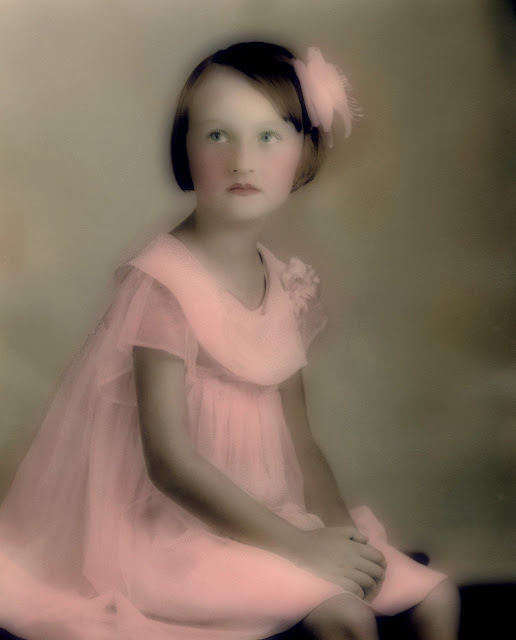 I love these old colorized photos and I am even old enough to have been the subject of a couple of these types as a baby. The monochrome photos were painted or stained with just touches of color.. in the clothes, the hair, the eyes and such. Here she is all dressed in pink with just a blush to her cheeks. This mother and grandmother will celebrate her 81st birthday in September... and she still wears pink... bold, hot pink! Tennessee Chick graciously hosts Saturday Photo Hunt each week... and this week's theme is "pink".